Towering above center ice, the main scoreboard is a primary focal point for fans at any game and offers unparalleled exposure. 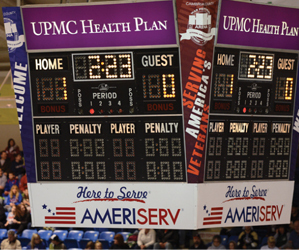 Situated on both ends of the arena, this scoreboard is a constant point of reference for fans keeping track of the game. There’s no better way to be part of the action than with your logo proudly showing from beneath the ice surface. Logo positions include high-visibility options at center ice, each attack zone, behind each goal, and inside the face-off circles. 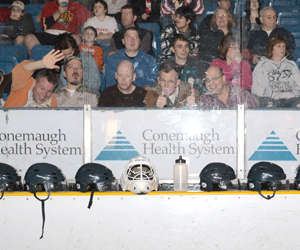 Put your company in the middle of the action with the most classic form of hockey advertising – the dasher board. 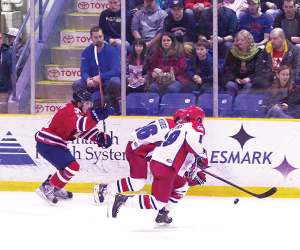 Reported by our fans as one of the most-noticed forms of arena advertising, dasher board advertisements also often appear in a wide variety of photo and video coverage of Tomahawks games. A new option at the War Memorial, glass wraps line the glass just above the dasher boards in each attack zone. 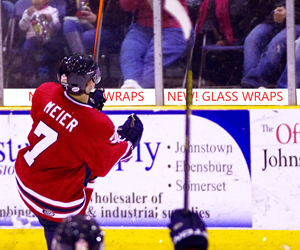 Take advantage of the high-visibility area behind the net to make your logo part of the action for every goal and save! 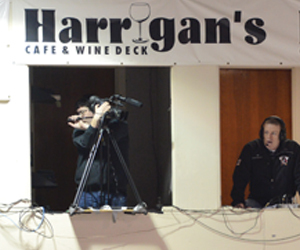 Showcase your company name with these premium positions behind the home and visitors benches, or behind the penalty boxes and scorer’s table. 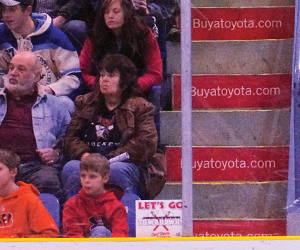 Prominently showcased behind nearly every seating section in the arena, the billboards are a prime way to announce your partnership with the Tomahawks and support for the Johnstown community. 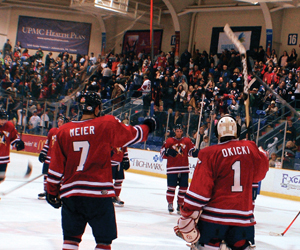 Whether hanging from the press box, the catwalk, the spotlight platforms or the four massive air handler units in each corner of the arena, these vinyl banners are a striking way to announce your company’s association with the Tomahawks to fans and visitors to the War Memorial. “Egress” signage above each exit or with “I-beam” signage along the building’s supports at the top of each seating section make a great impression, especially when paired with section entrance concourse signage! 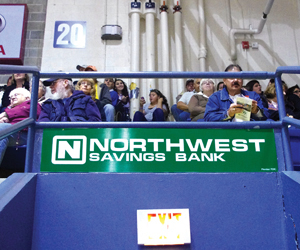 Fans will remember your company’s name with these liners displayed on every other step in seating areas across the arena, giving you a prime location with great visibility and repetition.